Volunteers are the heartbeat of Ducks Unlimited. 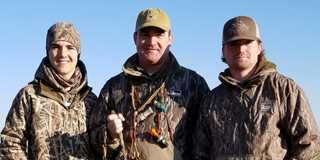 Shane and his sons enjoy hunting together. Shane Lemons is one of Oklahoma Ducks Unlimited's dedicated volunteers. This Oklahoma native and 4-year DU volunteer chairs South Central Oklahoma Chapter committee. As an avid waterfowler who has shared his passion with his two sons, Shane sees his engagement with DU as a way to ensure the future of waterfowling and preserve the heritage of those who came before us. He also sees the broader impact of DU’s conservation projects.